‘Minute to Win it’ how many of you have seen this game show? Assuming a majority, you will probably agree to the fact of how exciting, thrilling a timer or a countdown can make a situation. It is seen that, a timer not only excites the person that’s subjected to the timer but also the one that’s set it. Cutting the long story short, I simply want to emphasize on how a countdown can thrill your audience and then compel them to act before time runs out! 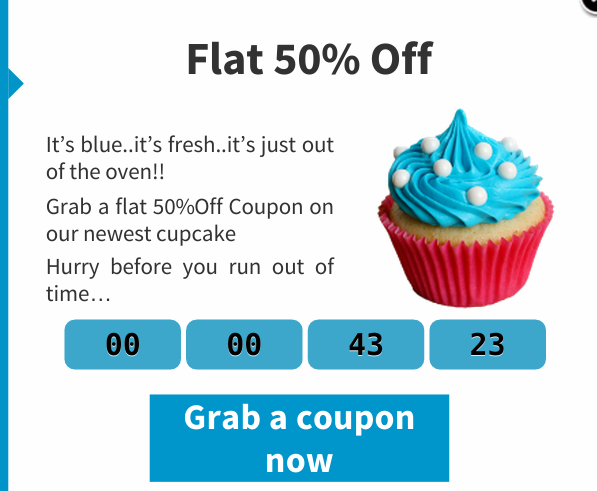 For an e-commerce stores, countdowns have proved to be very handy and have grabbed tons of eyeballs. Here are a few examples of how countdowns have been used over the years..
Show a special offer for a particular period of time. Honestly speaking, there are LOTS of Countdown Timer plugins available for WordPress (both the free and the paid). Here’s an exclusive list I went through. Very easy User Interface and Settings page. Sleek, Stylish and Modern designed Countdown Timers. Possibility of adding Multiple Countdowns at different places. Copy the shortcode and paste it in the message body of the Icegram campaign. Note: A countdown plugin can only be integrated with Icegram if it provides the shortcode functionality. Also, the methods used to find the shortcode differs from plugin to plugin. Hence the way of integrating them can be different in different cases. Any issues? Any suggestions? Tried these or any other countdown plugins? Do let me know your experience below.. Here is a step by step walkthrough that can help you do the same.